Himself - Narrator: Are you happier now than you were then? 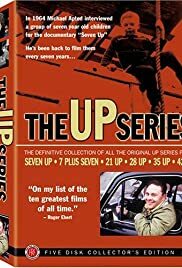 The second film in the "Up" series, "7 Plus Seven" catches those darling seven-year-olds at the awkward, self-conscious age of fourteen, which based on this film is evidently a universal. The film is cut between footage from "Seven Up" and footage from seven years later, which is at first jarring since cuteness quickly becomes smugness, and the like. Although, as predictable of the age, the Q & A approach chosen for the first film often feels like pulling teeth, certain key traits and moods of the children in this one will likely dictate far more about what's to come in future installments than could be conceived from volume one. This is a brilliant series of films that is just getting revved up with 1970's "7 Plus Seven'.